Continuing the upward trend, NXT put together another near-classic show with Rival, which paid off the two-month Zayn vs. Owens feud and also shook up the Women's division a bit. This show once again featured some incredible action, particularly in the final three bouts, and was overall on par with the first TakeOver. Starting things off was Hideo Itami vs. Tyler Breeze; a decent match but a little underwhelming. I don't know if Itami and Breeze just didn't have that much chemistry or if Itami was having trouble adjusting to NXT in general. The ending was a bit out of nowhere, as Itami won with a running kick. Thus far Itami hasn't come close to his work in Japan. Next was the only miss of the night, as Baron Corbin faced Bull Dempsey in a brief but inoffensive little brawl. I think this was Corbin's first real feud and Dempsey provided a change from the usual Corbin squashes. Ultimately though Dempsey wasn't much of a challenge and Corbin won in under five minutes. The Tag Titles were up next in a bout that almost fell off the rails. Blake & Murphy defended against Lucha Dragons in what turned out a very fun tag match with wild tandem moves and a ton of nearfalls. Both Sin Cara and Kalisto botched moves early on but once they found their footing this match settled into a nice little outing. After a blind tag Kalisto hit the Salida del Sol on Murphy only for Blake to roll him up for the pin. Nice stuff. The triad of excellence began with Finn Balor vs. Adrian Neville. This was one helluva good #1 Contender's Match that started out methodical with Neville once again wrestling more like a heel, but the match escalated into some nice oneupmanship with a red-hot crowd. Balor countered the Red Arrow by raising his knees, rolled up Neville up for a two-count, and then hit the Coup de Grace for the win. This was good enough to be a main event, and it was only fourth out of six. The real show stealer of the undercard though was the 4-Way Women's Title match, as NXT's "Four Horsewomen" tore the house down with a non-stop war. While 4-Way matches are often a tough sell for me, all of these women delivered; Charlotte played the dominant Champion, Sasha and Becky were the scrappy challengers, and Bayley was the underdog who showed nary a bit of offense until late in the match. After nearly pulling off an upset, Bayley was tossed out of the match along with Becky, and Sasha locked in the Bank Statement on Charlotte. Charlotte fought the move for about a full minute before Sasha rolled her backward for a pin and the Championship. While not on the level of Charlotte vs. Natalya, or the later Sasha-Bayley bouts, this was still a super high-energy match and began a trend of the women routinely upstaging the guys in NXT. 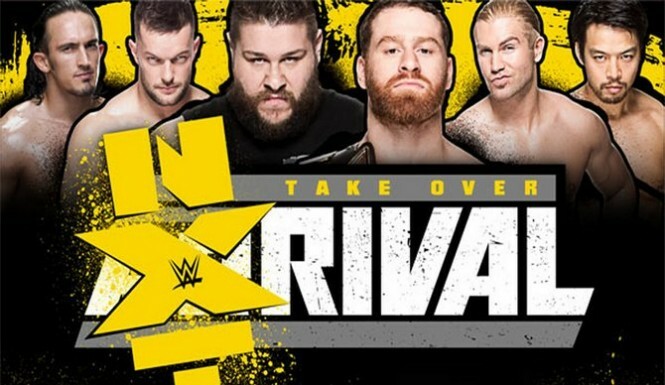 The main event paired up old frenemies Sami Zayn and Kevin Owens for the NXT Championship. Wow. This was one of those main events that had great action but also told such a compelling story. Owens' role was akin to Lesnar's when he suplexed the bejeezus out of Cena. But this match ended up stronger than that one because Zayn got to fight back more and also because Zayn is a more convincing underdog. So the crowd actually became visibly concerned by the end when Owens hit five or six powerbombs in a row. Finally the ref stopped the fight and awarded Owens the NXT Title. Just a fantastic piece of drama between two guys with great chemistry. Not much else to say about this show; it was an excellent TakeOver special that arguably tied the first TakeOver as the best in the series thus far. But NXT would continue to outdo themselves in the coming months.